Stanford University has one of the longest and most time-intensive supplements in American college admissions and, if their application numbers are any indication, this has done nothing to dissuade nearly 50,000 students from applying just last year. Stanford’s reputation as an intellectual, competitive, entrepreneurial, quirky California powerhouse—in academics and athletics—can make these essays feel even more challenging than they ought to be. The short and sweet version of our advice? Be yourself. You’ll find that an open, honest response bears much more fruit than a manufactured answer that targets what you think the reader wants to see. The University of Virginia has always provided some of my favorite supplemental essay prompts (and not just because it’s where I went to grad school). They are short (250 words max) and they are personal. Both of these mean that a student is forced to get to their point quickly, something I find students struggle with when they have a longer word count, and they are forced to really think about what makes them tick. If you look at all the available prompts offered in the first section of the UVa supplement, the theme would be this: What do you value? All four options essentially ask a student to address this larger question. Even the seemingly breezy, “what is your favorite word and why?” is essentially asking a student to give the reader a little insight into what they think is important. Because the four prompts focus on the same core question, let’s look more deeply at just one. The University of Chicago’s essay prompts get a lot of attention, and rightfully so. They are typically some of the most interesting and thought provoking that an applicant will encounter. When I was an admissions officer at the University of Chicago, I would regularly hear from applicants that part of the reason they applied was those essay prompts—they couldn’t wait to grapple with them. By contrast, in my later life as a high school counselor, I’d hear from some students, “I don’t want to apply there—those essays look too hard!” Clearly, the essays are serving their purpose for the admissions office by attracting the right students, those who find Chicago’s eccentric brilliance (cough, nerdiness!) to be a match for their own spirit. So let’s dig into the essay questions themselves. First, just like all supplemental essays at schools which read applications holistically, the Chicago essays should be understood as puzzle pieces that form part of a whole. Each essay fulfills a different part of the application, and each is important. 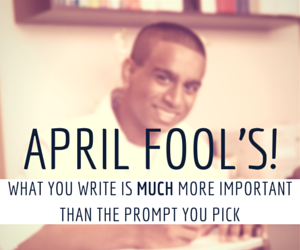 Today, we continue with the third post in our College Essay Prompts series. The supplemental essay as a whole usually gives application readers more insight into the student’s character and interests than the Common App does on its own. When I was an admissions officer at Tufts, this final essay was always my favorite; it provided the biggest and clearest window into the applicant’s personality. With the following six, very different, options to choose from, Tufts applicants got to write an essay they wanted to write, about something that actually mattered to them. While this is a simple question to ask, it’s honestly not an easy question to answer. The good news is that it shouldn’t be nearly as difficult as the personal statement you just wrote, and there’s plenty of research out there to support your efforts. Here are a few tips to help you approach these questions. Over the last few weeks I’ve shared a few tips on mastering the UC Application (be sure to read Part 1 and Part 2). To close out this series, today I’m sharing two of the most common essay mistakes I see UC applicants make. I’ve never counted, but I’ll estimate that I read over 100 different essays for the UC application each year. If that seems like a huge number, imagine being an admissions officer at UCLA, where over 112,000 students applied for fall admission last year. Some students choose to write about sports. Or their love of helping others. Or even about their unusual hobby of collecting those kitschy plastic-domed snow globes. Whatever the topic, the college admissions essay is meant to reveal a glimpse of a student’s character, one that – ideally – will help set that student apart from the thousands of other applicants vying for a spot at that same institution. Late Tuesday afternoon, the Common Application announced its new lineup of essay prompts for the 2015-16 admissions cycle. And while this proclamation is certainly big news, I’d like to remind current high school juniors that there’s no need to agonize over which prompt they should choose.